Following in the (tiny forest) footsteps of yesterday's post about The Gnome-Mobile, here's another 12-cent Gold Key comic book from the 1960s. 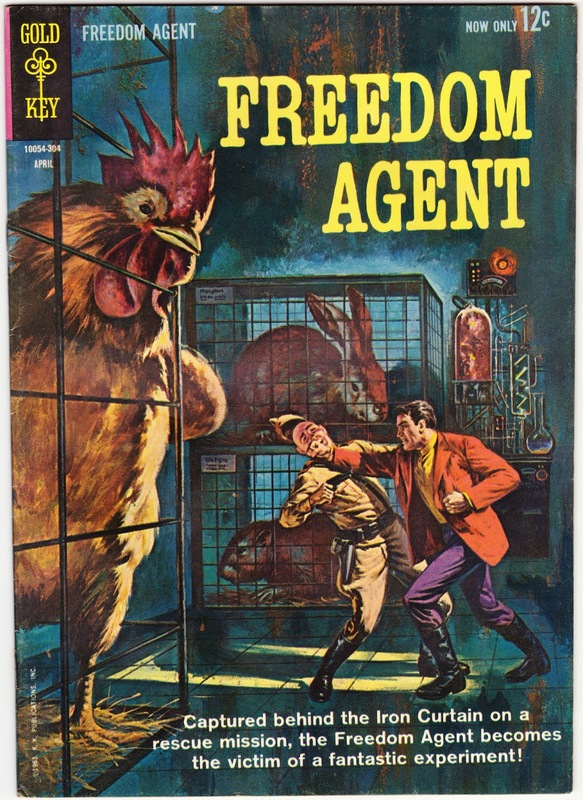 It's Freedom Agent #1 from April 1963. Freedom Agent, aka John Steele, was a very short-lived comic book hero. According to the wonderfully titled website Spy Guys And Gals, John Steele was only ever in two comic-book issues. Freedom Agent #1 was the only issue from that run. A year-and-a-half later, in December 1964, there was John Steele Secret Agent #1 from Gold Key. That was also a one-shot. Both issues were written by Paul S. Newman, and Steele's adventures included infiltrating a research lab, investigating a fireball in Tibet, stopping invisible saboteurs, and assuming the identity of a Latin American dictator (in a possible inspiration for Moon Over Parador, a 1988 comedy that I regrettably paid to see). 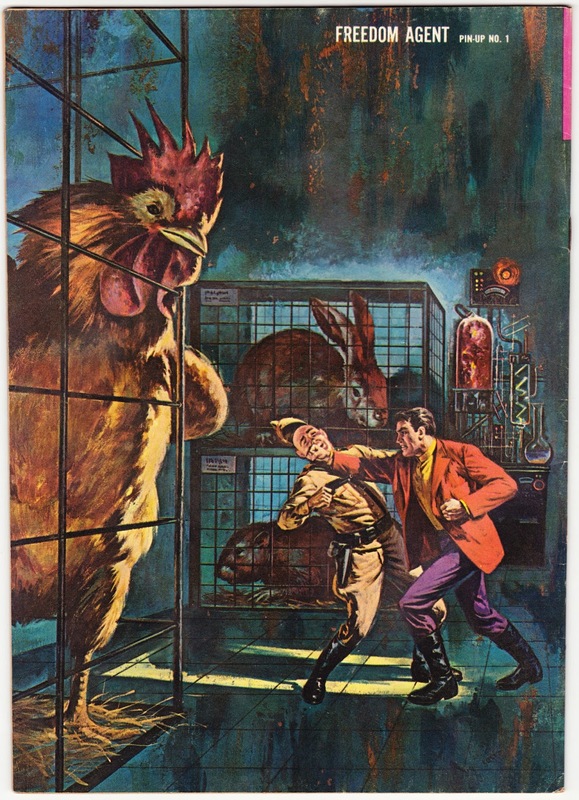 In my eyes, though, I look at the amazing Gold Key cover pictured above and have this vision for Freedom Agent: He's a hero who, while wearing a completely inconspicuous red blazer and purple pants, rescues chickens, capybaras and Flemish Giant rabbits from nefarious individuals. He is a liberator of all animals, fighting for their freedom. He's the kind of guy who makes a tractor trailer filled with turkeys pull over and then takes the turkeys to a safe place to spend the rest of their lives. And that's just his morning commute. And I see no reason why my version of Freedom Agent needs to be named John Steele. I reckon you could call him ... Baron Von Papergreat. I had originally envisioned my fifth-tier-but-definitely-canon Marvel superhero as being a bit more roly-poly and bookish than Red Blazer Agent, but I think this line of animal-rescue adventuring could work for him. Liberating chickens and bunnies is a little less stressful than, say, battling Doctor Doom or Dormammu.